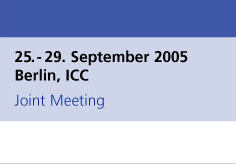 On behalf of the German Society of Ophthalmology and the European Society of Ophthalmology we would like to invite all representatives of industry to participate in the biggest European congress on ophthalmology of 2005. Internationally recognised scientists and researchers, mainly from Europe, but also from around the world will take part in the congress. The current status of scientific knowledge and research from the diverse spheres of ophthalmology will be presented in the form of symposia, keynote lectures, courses and many other events. In addition, this congress will provide an opportunity to advance communication between ophthalmologists, researchers and industry for the further development of ophthalmology. Enterprises from the various areas of the pharmaceutical and medical appliance industries, lens manufactures, technical literature publishers and other cross-over concerns will have numerous possibilities to introduce their products and new developments to a large circle of medical professionals. With 4700 delegates, the German Society of Ophthalmologys 2004 annual meeting was one of the large ophthalmology meetings this year. It is only with your participation and through your generous financial support that congresses of this nature and importance are possible. We would therefore like to give a very warm vote of thanks to the enterprises that have so far supported the DOG through their practical and political commitment. We are pleased that this is evidence to all forthcoming participants, representatives of industry and the medical scientific profession that the transfer of up-to-date information and medical knowledge brings with it success. In order to make further mutual progress, it must be our obligation to maintain the welfare and support of modern therapeutic and operative methods that are used on our patients. We anticipate your active participation with delight and the prospect of an interesting and constructive exchange of scientific ideas. Through its attractive and multicultural potential, Berlin, Germanys lively capital, offers you many possibilities to relax and be entertained after an industrious days work. We look forward to hearing from you shortly and working closely with you.